Doug Komen and Curtis McConnell, founders of Great Masters Art Science and Engineering, will introduce the role of science and technology in art authentication, and how this technology is used to create truly unique and interactive experiences not available at any other museum. Komen and McConnell are colleagues of Maurizio Seracini, who pioneered the scientific technology and processes that will be featured in the lecture. 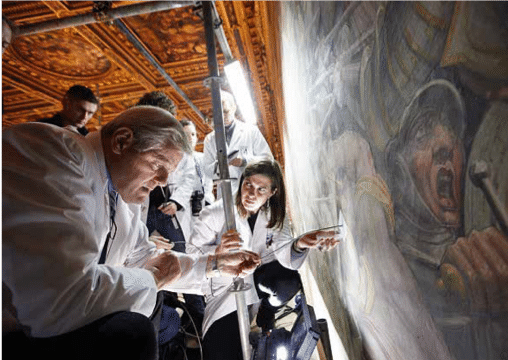 A diagnostician of Italian art, Seracini has been well known for his search for the lost Leonardo da Vinci mural, The Battle of Anghiari in the Salone dei Cinquecento of Palazzo Vecchio, Florence, and for his diagnostic survey on Leonardo’s Adoration of the Magi. Due to a last minute scheduling conflict, the original presenter, Maurizio Seracini, will be unable to participate. However, the Museum is happy to announce that his colleagues Doug Komen and Curtis McConnell will be presenting on this topic in his place.